Repair and Sculpt on a new, exciting level! FIXIT Sculpt is great for many uses that require all of the features and benefits of our traditional FIXIT plus offers exceptional sculpting qualities. It has a firm clay-like feel that resists sagging and drooping; holds detail & impressions. Generous 4 hour working time. Flat matte finish, accepts paints and stains. Great for intricate sculpting work, antler & bone art, ceramic repairs & more! 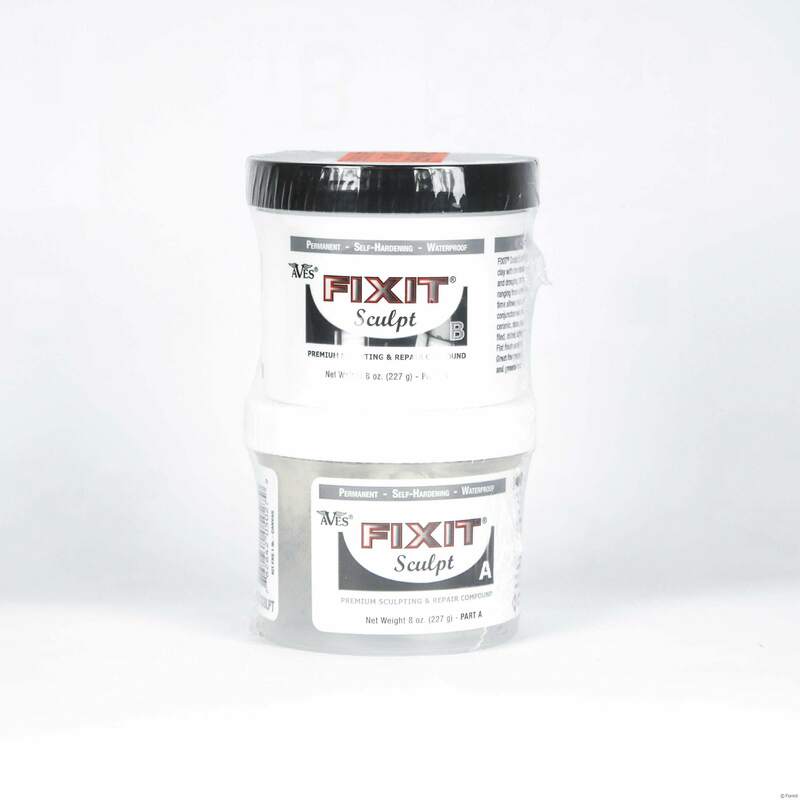 Fixit & Fixit Sculpt are available in packaging of sets of 110 grams and 440 grams. Great for those that need extra working time for intricate sculpting work. Excellent for Antler & bone art, or ceramic repairs...more! Measure equal parts of A&B; both have a putty-like consistency. Mix & knead together 2 minutes or until thoroughly combined and a uniform color is achieved. *Note that incomplete mixing will give poor results. FIXIT® Sculpt is now ready to use and has a working time of 3-4 hrs. FIXIT® Sculpt can be smoothed or textured with a finger or tool and water before set-up. Paint wet or dry. *24 hour cure time is required for product to be waterproof and for hard finishing purposes such as sanding, grinding, drilling, tapping, tooling, carving, lathing, etc. *Shelf life can be extended by refrigerating or freezing. FIXIT® Sculpt is freeze-thaw stable. Extremely adhesive, durable and strong; stands up to UV, fuels, outdoors, etc. Safe up to 500 degrees F.
Adheres to almost any clean surface including ceramic, fiberglass, foam, glass, metal, plastic, stone, wood, more! Open working time about 2-3 hours, cures hard overnight (24 hour full cure). Apoxie Fixit is the ultimate permanent, self-hardening, synthetic clay. that combines the features & benefits of sculpting clay with those of epoxies. This product offers enhanced detail properties, plasticity, accuracy and handling features make this clay very user friendly. Apoxie Fixit offers superior modeling, impressions and detail finishing, with a flat skin-like texture. FIXIT® is now ready to use and has a working time of 2-3 hrs. FIXIT® can be smoothed or textured with a finger or tool and water or Aves® Safety Solvent before set-up. Paint wet or dry. *Shelf life can be extended by refrigerating or freezing. FIXIT® is freeze-thaw stable. Adheres permanently to clean surfaces: porcelain, ceramic, vinyl kits, polymers, foam, fiberglass, wood, some plastics, and more! Hard & durable finish; can be sanded, tapped, drilled, carved, lathed, or otherwise tooled, without chipping, cracking or flaking. Paint or stain wet or dry.